Priscilla serves as the Chief Nursing Officer of Duke Raleigh Hospital. 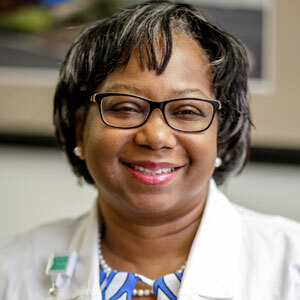 Previously she served as the associate CNO, Clinical Operations Director, nurse educator and staff nurse in perioperative services at Duke University Hospital. She was also a staff nurse at Duke Regional Hospital. Priscilla obtained her BSN from North Carolina Central University, Durham, NC and MSN, Post-Master’s Certificate in Nursing Administration and DNP from Duke University in Durham, North Carolina. Priscilla is a TeamSTEPPS Master trainer and a certified nurse executive and OR nurses. She is a member with NC Nurse’s Association, AONE, NCONL, ANA, NBNA and AORN. She serves on the Wake County Urban Ministries Board, North Carolina Foundation for Nurses, Zeta Phi Beta Sorority, Inc. and a member at Union Baptist Church, Durham, NC where she is the Assistant Sunday School Superintendent and a Deaconess. She is married and has 2 adult daughters and one grandson.